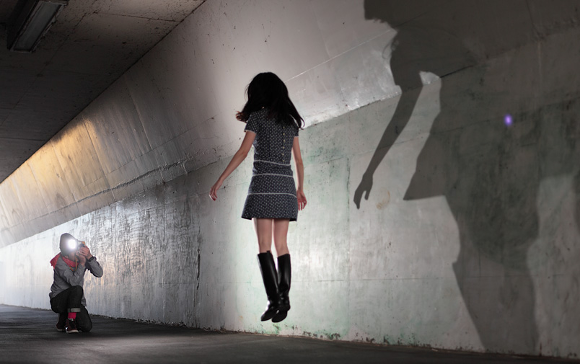 ↑Natsumi Hayashi lives in Tokyo and mainly photographs levitating self-portraits, sometimes even in 3D—see her ↑how-to. Her blog ↑yowayowa camera woman diary almost exclusively consists of the mentioned levitating pictures (with some cats interspersed) which for quite some time appeared on a daily basis. To my eye the pictures have a poetic quality. The sheer mass of them, no comments whatsoever, the somewhat distanced facial expression—all adds to it. Natsumi had an ↑exhibition of her pictures in 2012, ↑another one took place in late March 2013 in the Spiral Garden. 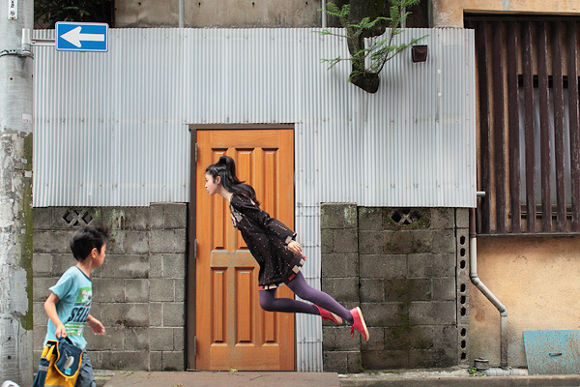 Also in 2012 her first photo book, naturally titled ‘Today’s Levitation’ was published by Seigensha. Finally I know where all the levitating online pictures from East Asia stem from—the fashion was started by Natsumi’s blog and then went viral. On the one hand the pictures are instilling within me the ambience of some of ↵Mœbius‘s drawings. On the other hand I’ve got an association with certain visuals from Clive Barker’s ‘↑Lord of Illusions‘ (1995), showing illusionist Swann levitating, but can’t find the right picture.